Today I commented to another sailor, "We have the same conditions every day, just from a different direction." As the wind clocked around, we experienced some marginal breeze from the northeast. Some really big shifts came throughout the afternoon, and it was as gusty as usual. The committee held two races today, and were thinking about having a third, but the wind didn't pick up enough to have a planing race. I'm working on managing my energy and efficiency in the marginal conditions, and today went really well in that respect. I am getting the hang of working the rig in the harness. Also, we've been working on improving my pumping efficiency (especially downwind) so I don't crunch up my body and use my arms too much. The basic rule is to extend your body so you have more leverage over the rig and use your legs and hips to pump the sail. Extending your body and being light on your feet also helps you get planing faster as it powers up the sail quickly. We are expecting more marginal conditions tomorrow out of the southeast. Hopefully, there will be some planing races so the committee can get in three, making up for the missed races on Monday. It will be nice and warm and we're looking forward to being out on the water tomorrow and concluding the regatta. Some really nice racing occurred today in light to marginal conditions. We waited on the water about an hour for the wind to fill in, giving us ample time to joke around and relax a little. Our race committee is experienced and as soon as the wind stabilized, racing was underway. Once again, the priority was staying in the pressure. There were some really big left shifts every once and a while, and the trick was to stay with them. The right side of the course sometimes didn't have much pressure at all. My focus for today's racing was basically the same as yesterday. I am working on staying in the pressure, being aware of what's going on around me, and working the rig as much as possible to go faster. I'm trying to spread my effort through the entire racecourse and applying it to smaller situations where I can gain advantage, rather than going hard for the entire race. This allows me to make better decisions, to think more about what the other sailors are doing, and to conserve strength for when I really need it. The discrepancy between the front and back of the RS:X fleet seems huge. However, there is no real secret other than the sailors have been doing the sport long enough (usually 8+ years) where tactics, technique, and fitness are all automatic. The very best sailors have the fastest boardspeed and are able to pull themselves out of bad situations by being fast. In the middle of the fleet, where sailors are all about the same speed, different situations can make or break a race, and tactics in these shifty conditions are more important. I can feel that I'm on the verge of being able to actually "race" (meaning the three elements are coming together). The wind should be marginal for the remaining two days of the regatta (sigh) so there will be plenty of opportunity to build the "racing" experience. We are looking forward to being out in the Florida sunshine and warm wind again tomorrow. After a lay day yesterday, the fleet was ready to race in today's sunny, marginal northwest wind. Miami is famous for this kind of wind, and it makes for some really tough conditions. It's all frontal, and flows over the land and tall buildings, so it ends up being really shifty and gusty. During racing, the wind slowly veered right, slowly making the right side of the course favored. The priority of the day was to stay in good pressure at all times. The RS:X is an "all or nothing" kind of board (due to its hefty size and weight), which means that you can either be going fast in good pressure, or barely moving in the holes. This was made difficult by the shifting breeze. The pin end of the starting line was favored (that's the left side looking up a course) and the right side of the course was favored. A basic rule of starting is that you should start on the side of the line closest to the direction you want to sail (if you want to go right, start on the right or boat end of the line). However, since the left end (pin) was favored, I hung around down there and ended up having some really great starts. After you've had a good start on the favored end of the line, but have to go the other way to the favored side of the course, what do you do next? The answer is to tack out and try to remain in the "control" position on top of the fleet. This was made difficult by a big hole in the middle of the course, created by the wind shadow of some tall condominiums and the downtown Miami high-rise buildings. As the breeze came in from the right, the goal was to ride the best pressure up the course and not be lured into sailing too far right on a big header. Another aspect of racing that I was concerned with today was being in "attack" mode and recognizing advantageous situations so that I could act on them. As I like to go into endurance athlete mode and hammer away at pumping the rig, it's more difficult for me to go into a 60-70% effort mode and work the rig in the harness in order to see where wind shifts and other sailors are on the racecourse. I managed to accomplish this the second race, and practicing this more will help bring together all the elements of racing boards. The forecast for tomorrow is for lighter winds out of the northeast, which means more marginal conditions. I'd like a few days of really light air or big breeze, but around here this is the prevalent condition. However, it gives me a chance to work on racing well in my least favorite condition and improving my game. My camera is still gone (stolen) so I most likely won't be able to post pictures from the coach boat and racing. You can see some pictures of the racing for the boat fleets here. After a week of training, the Miami OCR is finally upon us. I'm working with coach Mike Gebhardt, the other American girls (Lisa Kremer and Solvig Sayre) and Carolina, my Brazilian training partner from last summer. We have spent the last few days getting our gear ready, registering for the event, finding a coach boat, and other last-minute logistics. The first day of racing for the RS:X fleet (and a few other boat classes too) was a washout. The committee delayed us for a line of weather coming through. Rumors of waterspouts around Key Largo made the committee decide to abandon racing for the day. Although it rained heavily for a short time, we never got to see a waterspout, which was slightly disappointing after all the hype. Tomorrow three races are on the schedule to make up for the two missed today. We're all pretty well-rested at this point. I did some maintenance lifting in the gym today just so I wouldn't feel undertrained going into the day tomorrow. The rest is probably good for me as I usually charge full-on into a regatta without much of a taper. I may have difficulty posting pictures, as I somehow lost track of my camera today and someone picked it up (I'll never see it again). Meanwhile, you can enjoy regatta pictures and results at the Miami OCR website. The Alex Caviglia Bluewater Classic, held at the Shake-a-Leg sailing center in Coconut Grove, is usually a good draw to get Formula sailors to Miami for a few days to enjoy the warmer weather and practice for bigger events. It's a treat for the local sailors to train with a lot of good guys, and see the latest and greatest in Formula equipment upgrades. On Friday at the causeway (our normal sailing spot) everyone had a productive afternoon testing gear and tuning up against each other in big lineups. Formula testing is a lot of fun and very technical, and it's easy to see which guys have the best equipment combination or who has the gear most tuned up. Afterwards, we have big discussions on the beach. Dave Kashy and Alan Bernau, part of my team from Maryland, showed up after driving all night. Dave brought some new fins, which a few riders tested. Of particular note was an "85-15," which is a fin made to be 85 cm long, then cut down to 70 cm as per Formula class rules. The big fin, tested by a Brazilian pro rider, showed some impressive light wind performance in the lineups. It sent the pro sailor upwind like a rocket, gaining in every gust. The training session took place in light wind, which was very different from the conditions we experienced on the first day of the regatta. In the morning, we had 20-25 knots of breeze from the southeast. Many Olympic-class boats were out racing, and the bay was cluttered with their courses and other powerboat traffic cutting through. The committee ran a windward-leeward course, simple enough, with a far upwind mark near Key Biscayne. They had to move the course once, while we waited. Finally, they ran one race. The race was a good experience and challenging dealing with tidal current, gusts, the ever-present weeds, and big San Francisco-type chop throughout the upwind half of the course. I kept everything under control and finished 9th. After lunch, we went out again only to find that the wind had dropped dramatically. Everyone was on their small gear with no time to change sails or fins. The Shake-a-Leg launch is notoriously difficult as we have to tack up and down a narrow channel without a centerboard, and the course is too far from the launch to have time to do this. After one race in very light wind (barely planing, and fighting weeds), our third race of the day was abandoned and everyone drifted back to the beach. Conditions on the second day proved equally frustrating. The wind was a beautiful southerly when we went out, but a big storm system moved in and at the last minute of our start, the wind shifted southwest and it began to rain torrentially in that tropical way. We sailed in and waited a few hours, then went back out to light wind. We had one race in the type of conditions I enjoy, light wind planing with big shifts and gusts. This makes for interesting, challenging racing which you have to strategize for before the start. However, the wind died at the beginning of the day's second race, and we drifted around the course. The forecast for the third day wasn't looking good for the Formula fleet either, and after waiting for wind in the morning, we went out to have the wind die shortly before our start. We started anyway, and ended up slogging around two laps of the course. I got on the wrong side of a few shifts and had a frustrating first upwind (imagine sailing this board and huge, stiff sail, tacking like a boat would sail a race), but had a good second upwind. I placed mid-fleet overall, which is a good result sailing against a lot of these fast guys, and am pleased with the way I am racing in the Formula fleet. I was a little frustrated by how the race committee handled the conditions. Formula is a planing class, and races where 90% of the fleet can't plane should be abandoned. On the first day, instead of sending the Formula fleet back in for lunch, two more races could have been accomplished for the day while the breeze lasted. Also, on the second day, if the fleet had waited on the water for the wind to switch, two or three planing races could have been accomplished. It is impossible to run races for Formula as if planing boards were sailboats. I feel happy about the way I'm sailing against some of the fast Florida guys, and I can see myself creeping up closer to them in training and results. I'm looking forward to my new 2010 KA sail quiver and making even more improvements in Formula speed and technique. 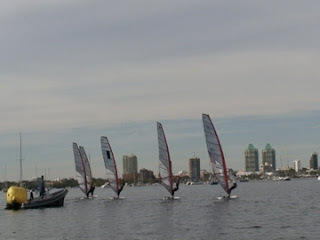 Next week the Miami Olympic Classes Regatta begins and I'm looking forward to another few days of RS:X training. 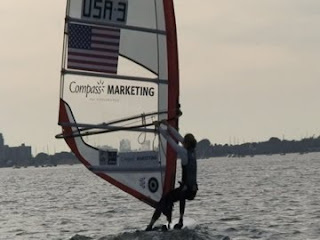 Thanks to my sponsors, Compass Marketing, and KA Sails, for helping me realize these sailing goals. Living in Miami for the winter is really helpful as it gives me a home base to operate from and a feeling of being settled and more grounded. It's allowed me to take care of finances, sell old and buy new sailing equipment, establish my goals for the year, and otherwise get life back in order. Physical training has ramped up and on the water I've been focusing on Formula. However, the Rolex Miami Olympic Classes Regatta (OCR) is just around the corner and I'm now back on the RS:X. The OCR is the women windsurfers' team qualifier, so it is a very important event for us. Many international sailors choose to make the OCR part of their winter training regimen, and I have been sailing with a few girls from Finland, Canada, and Denmark, and their coach. Transitioning back to the RS:X can be difficult as it takes a few sessions to get all the "feel" back. It's also always a small shock to go from sailing something fun, fast, and responsive, to something slow and heavy, but on the other hand, using huge Formula rigs makes the RS:X sail feel tiny and light in comparison. This week we will continue training, and then many of the international sailors, including myself, are participating in the North American Championship (Alex Caviglia Bluewater Classic) regatta held at the Shake-a-Leg Sailing Center in Coconut Grove, Miami. This is a good training regatta and warm-up for the OCR. The forecast for the weekend is big breeze from the south, so we expect some interesting racing. It will definitely be warm (in the 80s F), which will be a welcome change from the record lows we have been experiencing. It isn't supposed to be 35 degrees F during the middle of the day in Miami, is it? We are all looking forward to a good weekend of getting back to racing!